Office functions or parties may have a social context but bear in mind that these are still business events. You should always behave properly or it could ruin your chance for a promotion or wreck your career. In all social and business functions, try to dress modestly. Maintain your dress code, if possible, because it will gain you respect. Don't wear flashy or revealing clothing. Be natural, it's the way you maintain your poise and posture that counts. Professionalism is the name of the game in the corporate world. Arriving on or before the scheduled time will earn you good points in the eyes of your boss and the company's top executives. Never be tardy. When you arrive at the function site, don't head directly to the nearest drink bar or food table no matter how hungry you are. Instead, mingle a while with your colleagues. Greet your boss at the instance you see him. Don't go directly to the rest room either. If you must fix yourself or make a discharge, do it before entering the function area. Hotels and convention have common rest rooms which you can use. 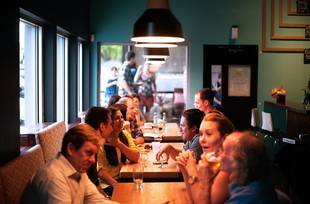 It is quite normal in a social event that people get to be introduced to other people. When introduced to someone, extend your hand, smile and maintain eye contact. Be confident and make sure you give them a firm handshake. Don't try to impress them with your intelligence, rather be a good conversationalist. In an exchange of ideas, people will know if you are intelligent or merely boasting. We often tell our children or little siblings to "behave properly" in a social gathering. In a similar manner, you also must observe proper decorum in a corporate function. Don't show a miserable disposition. Never show-of. If you have a companion with you to the function, remember that he or she is your responsibility. Stay close and introduce him or her to your boss and colleagues. Do not bring little children. Eat moderately and with poise. Don't gobble up on the buffet. Don't make them think that you are only there for the food. In a formal sit-down dinner, the utensils should be used from the outside in. Rest the napkin in your lap, and put it only on the table if you are finished. As to passing food and drink trays on the floor, use your left hand to pick up the finger food or drinks. Remember that your right hand will be used for handshakes. For canned and bottle drinks, use a glass. Don't drink directly from the can or bottle. Avoid alcohol unless you are invited for a toast. Don't drink straight up, go for just a sip. Remember that this is a corporate gathering and not a drinking party. You should remain sober all throughout until you depart. Try to find out who will be attending the party. That will give you a hint on what to talk about. Seek the ones that could influence your career and introduce yourself. Make small talks with them, if possible. Don't force any issue. Many times, you find yourself making promises to a specific guest or attendee. When you do, jot them down so you will always remember to do as you promise. Remember that in a corporate ladder, an unfulfilled promise could become a missing step in your career. You don't need to linger too long at the party. The important things are that you have already talked to your boss, expressed thanks to the host, mingled with your colleagues, greeted and talked to the most important guests, and partook of the dinner. Afterwards, you may say goodbye to them. Don't try to slip out without doing so.